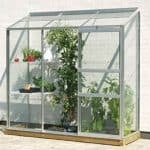 The large 12′ x 8′ Nison EaZi-Click Green Polycarbonate Greenhouse offers you a truly huge amount of space to grow plants and some delicious homemade veggies and fruit. You have a lot of room to organise your plants, food and supplies in here and thanks to the vast headroom this greenhouse offers, you will be able to walk around comfortably. While the greenhouse is designed so that it always stays very well insulated. If you do find that on a hot August day the heat inside is a little too much then you can just crack open the two included roof air vents to let in some fresh air. 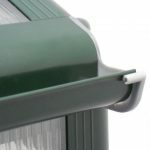 A cleverly designed guttering system is used on the outside to prevent rain from always running down the panels. A high quality aluminium base is included, meaning that you can build this anywhere you want. The EaZi-Click system makes building this greenhouse incredibly easy. The strong polycarbonate panels and that high quality anodised aluminium frame simply snap and click together in a very easy way. You will have this built in no time at all and even those of you who are not too keen on DIY will be able to put this together. 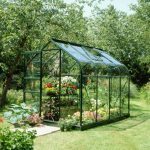 As one of the largest greenhouses in this line, the 12′ x 8′ Nison EaZi-Click Green Polycarbonate Greenhouse is ideal for those of you who are real serious about your gardening, taking care of your plants and even growing your own food. There is just so much room in here that, you will want to spend all the free time you have pottering around inside. We just love how much floor space this has and with there being 12 feet 7 inch of depth along with 8 feet 4 inches of width, you really do have all the space you could want. We were very impressed with the headroom that this greenhouse has as well. The eaves are 5 feet 1 inch high which is a little more than we are used to seeing, along the ridge there is 7 feet 2 inches of headroom so moving around inside here will not see you have to hunch over all the time. We really like how the apex roof looks due to it being so high. The way that Nison have designed this roof means that the water is never getting inside the greenhouse. One thing in particular that they have done which we really like is put a guttering system to stop the rain running down the roof and then down the walls of the greenhouse. Polycarbonate panels which are 4 mm thick are used for the walls and we really love how strong these are. 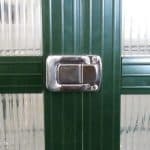 These are a great alternative to glass and they are certainly a lot safer which is ideal if you have kids. 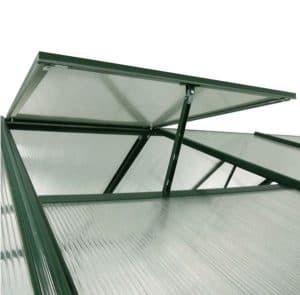 These panels will keep the prevent the UV rays from hurting what you are trying to grow inside, but they will also make sure it stays nice and warm in the greenhouse they do this by trapping air in the little ridges that are on them which keeps things inside insulated even when the sun is not out. Anodised aluminium is what makes up the frame and we really could not be any more impressed with this lightweight, but very strong frame. It makes the whole structure very solid and will ensure you get many years out of the greenhouse. One other thing we have to mention is how this frame along with the panels all click together thanks to the EaZi-Click system which makes building this very easy. Most of the other greenhouses we have seen do not include a floor so you either have to sort one out yourself or pay for it as an extra. Well that is not the case here, you actually are getting a high quality, aluminium base included with this. You can actually see it in the picture, it is a silver colour and will allow you to build this anyplace in your garden, even on grass. 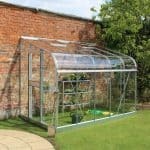 This is a very low maintenance greenhouse and a good soaking with the hose or even a bucket and sponge is all you need to clear off the dust and muck the wind will blow onto the panels. The EaZi-Click system actually allows you to easily take panels off and clean them which is something you might want to do if you have a rogue bird who likes to make a mess of your greenhouse. 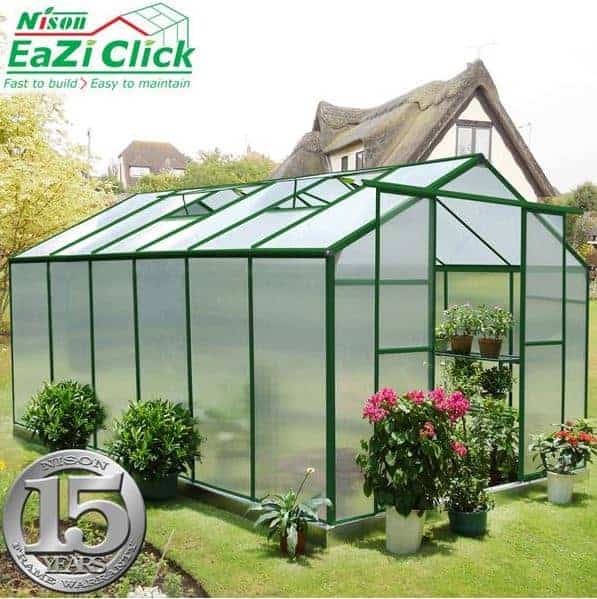 The 12′ x 8′ Nison EaZi-Click Green Polycarbonate Greenhouse comes with a very generous 15 year anti rust guarantee. Nison have used a very large set of double doors on here, just from looking at the picture, you can clearly see that these are close to 6 feet high. 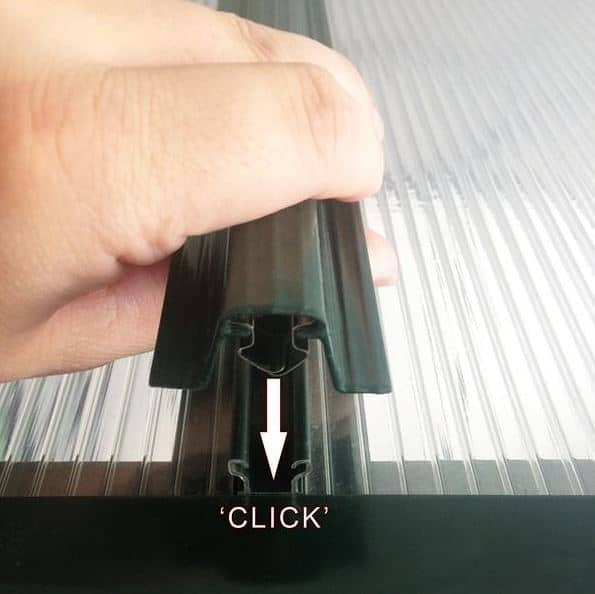 Using the same polycarbonate and anodised aluminium that they have for the rest of the greenhouse to make the doors, means that they not only fit in with the design, but they are also strong as well. Rather than use a standard swing door, they have made these really cool sliding doors which makes opening them very easy. There are a couple of vents that open on the roof so you can get some fresh air inside. We love how due to the larger size of this greenhouse, Nison have made there be two vents which can be opened. Due to the way this is so well insulated on a warm day it is going to get very hot inside here so you will be happy, you can crank these open and get some fresh air inside. No lock is included with the greenhouse, but the doors do slide shut very firmly. Actually, Nison say that the whole structure is draft free, so with the doors and vents closed this will be a very secure structure. You are not getting any privacy with this and to be fair that is to be expected as this is a greenhouse after all. We can just imagine all the fun you are going to have setting up this greenhouse. The huge space available means that you are really able to roll your sleeves up and organise this just the way you want without having to make any sacrifices. So while there is no customisation options for the outside, you are going to love having all that space on the inside to play with. As far as the extras go there really is not a lot you need to worry about with this greenhouse. They do allow you to add another vent to the roof for a cost of £54.99. However, we feel that the two you already get are enough. The Nison EaZi-Click system really is amazing, but if you are going to be taking panels off to give them a good scrubbing clean and then clipping them back on, they may wear out over the years. Well you can actually order a pack of spare, EaZi-Click Greenhouse Clips. These cost £12.99 and come in a pack of 24. Honestly even if you do not plan on taking this apart, buying a pack of these when you buy the greenhouse would be a smart idea. We are very impressed with the overall quality of the greenhouse. The materials used and the design really are very impressive. 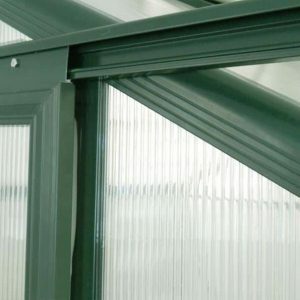 The framing is made so that it will not show any signs of rust and those polycarbonate panels are very strong, we can see you getting 20 or more years out of this easily. This really is the perfect size for those of you who love to spend time looking after plants and growing food. Offering plenty of floor space along with a very generous amount of headroom make this one of the largest greenhouses from Nison. Nison estimate that due to the EaZi-Click system, the installation time of this greenhouse is cut by 60 percent. This is very easy and with the help of a good friend, you will have no trouble at all. 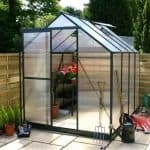 This is the most expensive greenhouse in this line, but we feel the size and the included flooring make it well worth it. Final Thoughts: We love how large the 12' x 8' Nison EaZi-Click Green Polycarbonate Greenhouse is. 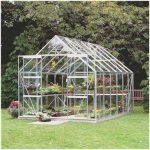 It really is an impressive looking structure and due to its size, you are going to be able to really organise this just the way you want and not have to make any kind of sacrifices like you would a smaller sized greenhouse. 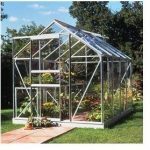 We know that the price may seem high, but when you take into account the size of this, the high quality and of course the fact that the floor is included then really this is one very fairly priced greenhouse and something we highly recommend to those of you who want a lot of space to grow plants and vegetables.